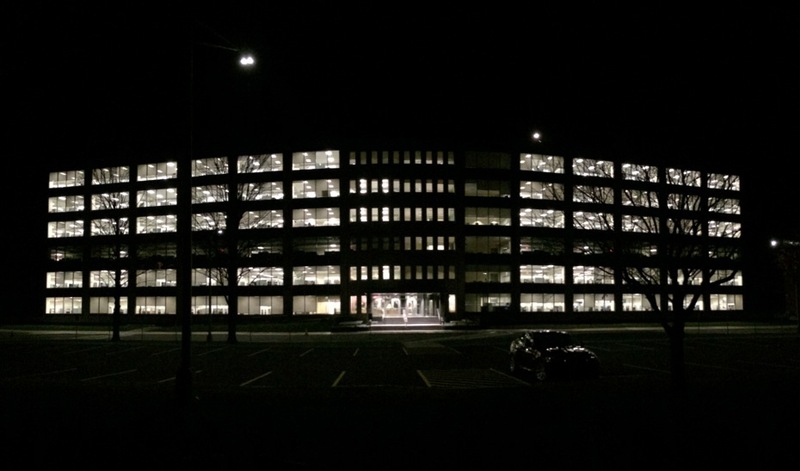 Building 5 at the State Office Campus got a big makeover this past year. And from the outside at least, we'd say a successful one. The exterior is now a modern take on the midcentury style of the rest of the campus. Also: Big windows. And it lights up nicely at night. Place looks empty. 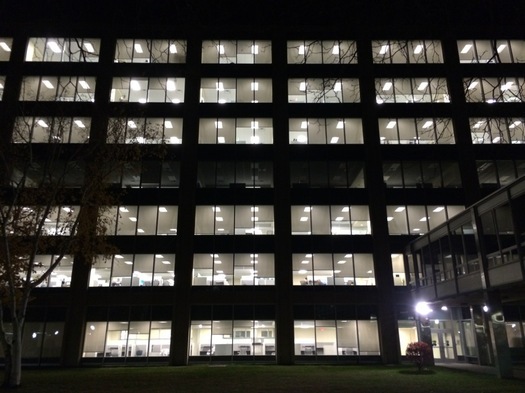 Are people there working at night? Why don't they turn the lights off?! I'm sure the place takes a long time to clean! It always occurred to me that the State Office Campus be used to create a New Urbanist City Center with offices, stores, and residences. Sort of a self-contained, walkable City-Within-A-City. It might be a good idea to connect the Harriman City Center with an expansion of the SUNY Albany Campus. A mixture of Students and Urban Workers could be the basis for a vibrant new space with Culture, Arts, Restaurants, Offices, Labs, and other Work Spaces. It could be developed as mixed use Community, and probably a base for High Tech, Biomed, Media, and other growth sectors. Sort of a self-contained New Urbanist City Center with attractions, museums, theatres, and other destinations. All could be connected to the rest of the City via CDTA and other forms of transport. Unfortunately, Governor Cuomo has seemed to have put these efforts on the back burner for his own efforts, removing the city of Albany's one good chance to get some significant private property on the tax rolls. Rumor had it that Whole Food was looking to develop on the people rich state campus, along with some of the partners involved with the Nano complex, but his administration squashed those efforts so that he could restack the state workforce and consolidate the stat workforce here. More folks working in Albany is a plus in my book, but privatizing the campus, in any capacity, would have been better. There is so much potential. Thanks for the response, Rich. Good information. I agree with you. There is so much potential with the Harriman site. I wish the people in charge had more imagination. And initiative. A New Urbanist/City Center approach would be a real benefit to Albany, I think.